Apparently, I'm a vigorous door-knocker, because it's tough for me to work out a scenario where I'd have the restraint to only knock twice on someone's door. Three or four times, sure, and certainly five if a quicker response seems necessary … but twice? It seems so calculated and brief. Yet, practically everybody tends to rap on doors exactly that many times in Don't Knock Twice, a British supernatural thriller from Caradog James, regardless of whether they're using a heavy knocker or if they're doing it by hand. Getting on this atmospheric flick for the way people knock on doors might seem like a nitpicky gripe, but it's a testament both to the forced, cliched design of the horror and the ineffectiveness of the mysteries contained within. 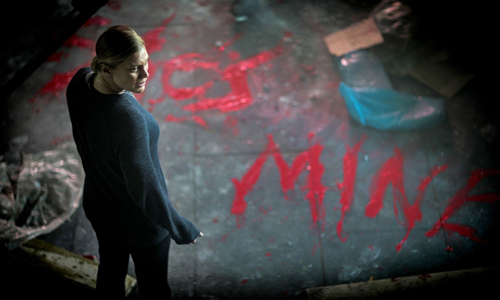 Folklore, mother-daughter turmoil, and a strung-out performance from Katee Sackhoff come across as stock elements slapped together and molded into a banal, overly identifiable supernatural tale, triggering déjà vu as soon as one arrives at its doorstep. Sackhoff plays Jess, a successful sculptor -- and wife to an even more successful businessman -- whose past with drug abuse led to her losing custody of her child, Chloe (Lucy Boynton). Nearly a decade has passed since then, and now Jess strives to regain custody from the state, so her daughter might move into their enormous house secluded from the urban environment. Chloe is, naturally, hesitant, but that changes shortly after the disappearance of one of her close friends. This happened, seemingly, in response to them both visiting the residence of a local person suspected of being a witch: a woman with unsolved accusations penned against her who, according to urban legend, will come to hunt down anyone who knocks twice upon her door. Fearful, Chloe seeks refuge with her mother; whether the distance will have an impact on the curse, and whether the mother and daughter will reconcile their differences, gradually takes shape through their labored interactions. While Don't Knock Twice received a wide theatrical release in 2017, it actually hit smaller festival venues in the fall of 2016, just a few short months after the arrival of Lights Out, the successful feature-length "adaptation" of a spooky three-minute short film. This bears mentioning because several similarities, both thematic and plot-centric, can be spotted in their premises: child custody conflicts, said child hiding from a supernatural curse in the house of a family member who once abandoned them, and the ways in which the monstrous antagonist travels -- and hits obstacles -- in getting to its target. Beyond those textual parallels, the two films also simply feel similar in tone and objective, lurking in the shadows while family issues are hashed out between paranormal attacks and suspiciousness toward whether the kids are distorting reality around them. Perhaps it's a reflection of the symptoms of frequently-used tropes, or perhaps it's yet another classic case of cinematic dumb luck that they're similar, but Don't Knock Twice immediately feels like a retread and never shakes that off. It doesn't help that the mother-daughter drama in Don't Knock Twice lacks effectiveness, and that's mainly because of murky characterization and the stiff chemistry between Katee Sackhoff and Lucy Boynton. Sackhoff evokes a similar wild-eyed presence to her character Starbuck from Battlestar Galactica, only without the sassy charisma and determination, coming across as an unstable figure instead of someone whose instability has been controlled enough to entrust with her daughter. Working with unspecific, rote dialogue about the complications of parenting while dealing with addiction and/or sickness, the interactions shared between Sackhoff's mother and Boynton's impersonal turn as her semi-rebellious daughter result in vapid padding-out between mild ebbs and flows of eeriness. Ideally, this push-and-pull between family members reconciling a traumatic past would enhance the suspense by deepening concerns for their well-being and progress, but Caradog James struggles to make that happen with these actresses, assuming teary eyes and raised voices are enough. While unsatisfactory, these aren't the main issues with Don't Knock Twice, the ones rooted in how well it functions as, y'know, a horror film. Caradog James lends some indie polish to the design, but he can't keep it from being a nonsensical, predictable paranormal exercise that doesn't cross the threshold between creepiness and scariness enough considering its dramatic endeavors come to naught. Using established folklore provides an inspired angle to the events, but hackneyed visual tricks -- overbearing red lights; cascading lamps going dark down a hallway; the face of a dead body changing to that of the person looking at it -- and the disquieting, yet mundane lankiness of the witch herself distract from those marginal hints at something more captivating. This only grows messier when the moving parts of this curse kick into gear, culminating in surrealism, misdirection, and an implausible amount of double-knock trickery that stumbles over its own internal logic. Once it approaches yet another of those trendy, obscurely bleak outcomes, you'll really wish Chloe simply hadn't knocked in the first place.